Dipped in marinara sauce or all on their own, Bosco cheese-stuffed bread sticks are a favorite for school cafeteria lunches. The cute little mascot Johnny Bosco is reputedly named for St. John Bosco, educator and patron saint of boys and youth. Since 1995, Bosco sticks have been showing up in school lunch rooms all over the United States as well as in supermarket freezer cases. Making this favorite for your youngsters -- or yourself -- is as easy as walking to the local pizza joint. In a glass measuring cup, whisk the yeast and 2 tablespoons of the flour with 1/2 cup of the warm water for about 10 minutes or until it's very foamy. In a large bowl, whisk the rest of the flour and salt together. With a wooden spoon, stir in the yeast mixture and then gradually add 3 cups of flour, stirring until completely blended and smooth. Add 1 more cup of flour and keep stirring -- it is going to take a bit of elbow grease now. With clean hands, check the dough for stickiness; if it sticks to your fingers, sprinkle in more flour, a little at a time, and keep stirring until the ball of dough pulls away from the side of the bowl. Sprinkle more flour on a cutting board and spread it around. Turn the dough out on the floured surface, cover hands in flour and knead the dough with vigor, turning it after every few kneads and adding flour to the cutting board as necessary. Knead for 10 minutes until the dough is smooth and stretchy. 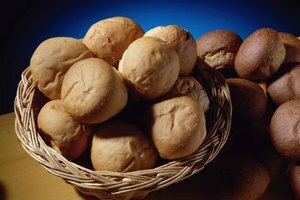 Divide the dough into two balls, roll them in flour, put each in a bowl and cover with plastic wrap. Put the bowls in a warm place away from drafts and allow to rise for 1 1/2 hours until doubled in size. On the floured board, roll one dough ball out to a 12- by 16-inch square. Cut lengthwise into 4 pieces and cut those pieces in half. The pieces should be large enough to loosely surround the mozzarella sticks. If they are not big enough, roll them out a little more. Wrap the cheese sticks in the pizza dough, pinching the edges together. 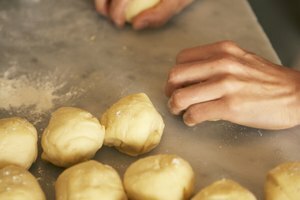 Set on wax paper and repeat the process with the second dough ball. Allow the bread sticks to rise for another 10 minutes. Melt the butter with the garlic juice or powder and brush the mixture over the bread sticks. Roll the sticks in the Parmesan and place them on a baking sheet lined with parchment paper. Brush the sticks with garlic butter once more. Bake the Boscos for 9 to 10 minutes and serve warm. Serve with marinara or pizza dipping sauce. Add pizza sauce and chopped pepperoni before you close the rolls. Omit the cheese and garlic butter and stuff the rolls with apple or cherry pie filling. Brush the rolls with plain melted butter.